Local authors, Rick Winston and David Holmes, will discuss what happened in Vermont when the anti-Communist fear known as the “Red Scare” swept the country. 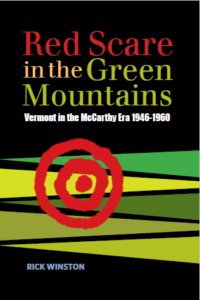 The first 20 attendees will receive a free copy of “Red Scare in the Green Mountains: Vermont in the McCarthy Era 1946-1960”. Light refreshments will be available. Come for a lively discussion in the Bixby Community room, Thursday, April 25th, 6pm-7pm.